A man accused of murdering a teenager recorded himself on Snapchat apparently celebrating the killing, a court has heard. 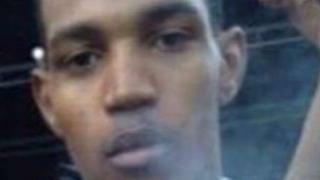 Raheem Wilks, 19, was shot dead close to Too Sharps barbers in Harehills, Leeds, on 26 January. Keal Richards, 21, of Francis Street, Leeds, and four other men from the city, all deny murder. The city's crown court heard the killing "had all the hallmarks of a gangland shooting". Prosecutor Dafydd Enoch QC told the court Mr Richards was filmed on Snapchat hours after the shooting giving a "whoop of delight" and reciting lyrics from a rap song about a gangland killing in a barber shop. Mr Enoch said the victim was a member of a gang called The Flock and he was "specifically targeted". He said co-defendant Jaydn Manners, 24, of Louis Street, was "almost certainly the actual shooter" but the killing was a "joint enterprise". Mr Manners was in a car with Mr Richards and co-defendants Keiran Hunt, 29, of Roundhay Road, and Tremaine Wisdom, 29, of no fixed abode, the court was told. They received a phone tip-off from co-accused Cornelia Benjamin, 21, of Reginald Street, of Mr Wilks's whereabouts, the jury heard. Mr Enoch said Mr Wilks was shot once through his heart from the back. "It was, you may think, a killing which was designed to send a message," he said. "Mr Richards and his co-defendants organised and executed this killing. It smacked of revenge. He said that Mr Richards was seen in the Snapchat video watching a YouTube clip featuring rapper C Biz and speaking a line from a song about a killing in a barbershop. Mr Richards then "gives a whoop of delight", the jury heard. Snapchat stories are not usually retrievable but police obtained the message with the help of the United States authorities, Mr Enoch said. Mr Enoch said Mr Richards and Mr Manners were convicted drug dealers and that Mr Wilks had "got himself at a young age into bad company". "There is an abundance of evidence that young Raheem Wilks was a member of The Flock," he said. "The raison d'etre of The Flock was primarily associated with a group of young men for the purpose of crime." Mr Enoch said this included supplying drugs and "an inevitable association with firearms".